djkardkreations: Hi there! Waving Hello! Lovely to see you! How has your week gone? I'm doing fine, considering, and happy to be a member of the Hyster Sisters now. Thank you all for your lovely get well messages and cards! With so many kind-hearted friends and family pulling for me and praying for me, I know my recovery will be smoof. And Doc assured us that nothing else will try to fall out of me in the future! On Monday, once the underwear drawer was organized, I had some playtime with Hammy. BTW, do you organize your knickers drawer before you go in the hospital? You know, Justin Case you don't come back? Anyway, I had a lot of nervous engerny, so I passed the time of day fondling, spindling, and die-cutting paper. This is a fun NBUS die from Winnie & Walter that makes QACAS cards even more QACAS than usual! Cut some of your prettiest pp with it, pop into a negative opening in matching colored card (bonus) and you'll be reaching for an antelope. I mean envelope. It's that easy. For this design, I checked my "words, misc." stamp case and sure enough, there was a there there! Just so you know, as soon as this photo was taken I turned that butterfly in the bottom right slightly so it angled the other way. I can tell it bugged you, too, so I wanted you to know I fixed it. I seriously can't remember the last time I saw someone use a stamp on a card and five minutes later, the stamp set was purchased and on its way to my house, but that's what happened with this new Wave set from The Ton. The card artist was LauraJane. Be prepared to be blown away by what she did! It's one of those stamps (like, say, a pineapple stamp) that might be trendy and then fade away. I am usually able to resist those, but there is so much cool movement in this wave and I love the sea, so I think I will use it a lot. It's a great stamp for either gender, too, especially for those elusive guy designs. For my card, I smooched DIs on my craft mat and spritzed them with water and then one-by-one I applied each part of the three-part stamps to my card. Then I white heat-embossed the first part stamp again to make the foam stand out and give the card some texture. I think I have both blue and aqua e/p so next time I will try heat-embossing all the layers for even more texture. Next, I watercolored the sunsetty sky using my Ziggies and attached the panel to a colored card base that I embossed with a stitch die. I wanted a sediment that was larger than the ones that come in the set, so I looked in my nautical stamps and immediately saw this fun and perfect NBUS sediment from the "Wicked Nautical" set by Paper Smooches. I loosely watercolored a piece of mixed media paper with ocean shades. I painted in the bottom portion with my sand-colored Ziggie, spritzed the panel with a few drops of water, stamped the NBUS ocean waves from Purple Onion, and that was the card base. I had an already-cut MFT stitched frame on my desk, so I played around with various stamps from the TT set and the scene was born. The large NBUS sediment, also from the same set, was stamped on sunshine yellow vellum. When I finally got it away from the hamster, I glossed up the beach ball so it would be shiny like the real plastic beach balls we used to blow up and play with ... I wonder if they still make those. 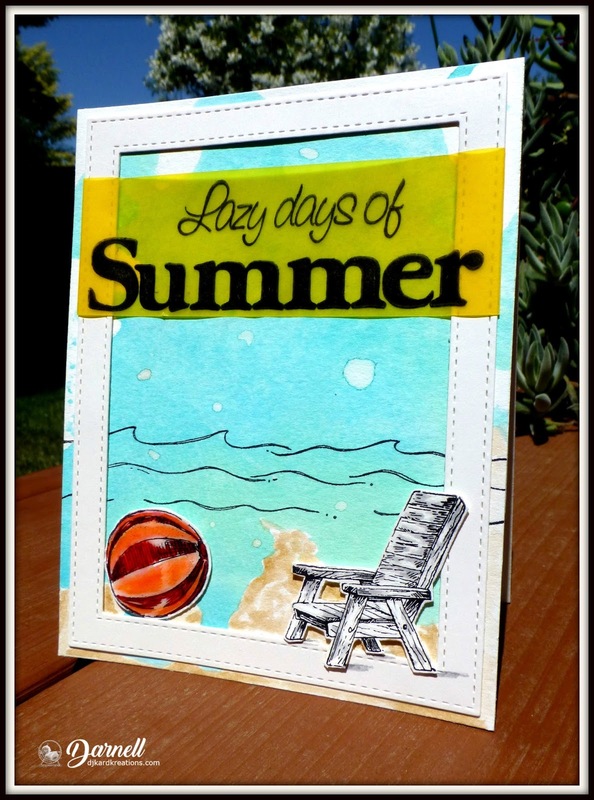 CAS Watercolour Card Challenge: Summer. Make My Monday: At the beach. Enjoy your day! No, seriously, enjoy! LITS! * I'll be back as soon as I can stay upright longer than ten minutes. Pleased to hear that everything went well with your op, Darnell - wishing you a speedy recovery. All 3 are fabulous cards (am waving 'hi' back)...love the texture on the wave one and the fun sentiment, too....super fun cards.....here's to a speedy recovery!! Beautiful cards! So glad you're home and that all went well. Happy to hear that your surgery went well. I'm sorry I haven't been around to visit much lately. I have been living in my own bubble. DH had lung surgery a couple of weeks ago and the nodule they removed turned out to be a metastasis of his earlier colon cancer. That means he will need more chemotherapy this summer after they have examined the tissue in more depth to determine the best treatment. The good news is that the cancer is slow growing, so the oncologist is hopeful we can beat the cancer forgood this time. I guess I'm responding to this news in a way not unlike your own outburst of nervous energy. I've been hiding in my craftroom to create cheerful cards. I have posted a handful of cards on my blog last night and there are more to follow. Glad the op went well - you must be getting pretty empty inside now! Gorgeous cards, especially that wave one. And I'm with you on the butterfly, it did need to be heading the other way. Which is crazy really, how often do we look at butterflies fluttering around in real life and think they'd look so much better if one was fluttering the other way? Three fab cards, the wave one is very topical. There is a programme on the BBC about it next week. Did you know the original was first created as a woodblock around 1831 by Japanese artist Katsushika and each print cost the equivalent of two helpings of noodles! So pleased to hear that the surgery went well and thrilled to know that you are home again too! Well you certainly put that energy to good use, your cards are all beautiful! I love, love the wave one, what a fantastic stamp set that is, the waves really do look like... waves... I look forward to seeing the next one, with more embossing! So glad to hear you are on the mend. Your cards are all gorgeous but that wave card blew me away! So much interest and texture! when I saw that wave stamp demonstrated my jaw nearly dropped...fell in love with it also and your card is so stunning...the white embossing really makes it look so real and foamy!! so happy to hear that you are all put back together and no more falling parts! glad you can get back to being crafty! Heart Hugs friend! Fantastic makes today matey, particularly loving the wave card. Nope, didn't reorganise my underwear drawer before I went in to hospital but .... mightily glad the op was successful and that your stay was minimal - best wishes for a full and speedy recovery and to everything staying put in future! Glad the op is over with and you are doing well. So happy for you that the surgery went well. Hope your recovery is swift and trouble free! Your cards are glorious. Love the butterflies on the first and the wave is spectacular. The beach scene is where you ought to be as you recover. Thanks so much for sharing and always inspiring! Hugs! Three wonderful cards, Darnell. Glad you're feeling better, but please take it easy! I was so happy to see you this morning and know everything went well. It is good to know you are put back together and no parts will be escaping again. It went well for the underwear drawer too. The cards as a result of surgery are just great. The wave one takes my breath away. The beach scene is so relaxing and beautiful. I love the butterfly paper you used on the first card. Now just hang out and use the beach scene to inspire you to relax and heal. So glad everything went well. Your cards are absolutely beautiful. Love the hi card. So beautiful with the butterflies. The wave is lovely. Delighted to hear you still have most of your parts and came through with flying colors. Hope your recovery is going as well as this blogpost sounds. I can totally understand your need to keep very busy prior to the big day. And, oh boy, were you ever productive. 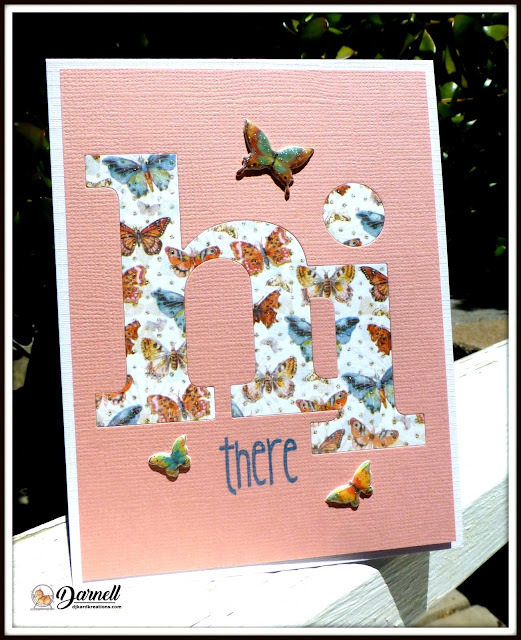 I adore that big "hi" die...so fun and easy to use...love it backed with that gorgeous butterfly pp. Up to now, I've resisted that wave stamp but the resistance has melted away...apparently, I need it. Saw Laura Jane's card too and after I picked my jaw up off the floor was going to order it but got distracted. When I thought of it again, convinced myself I didn't need it (like I NEED anything in my craft space) but I now, thanks to you, stand corrected. Your last card SCREAMS summer...wish I were at the beach right now. Maybe we should go??? Good to hear from you...thinking about you a bunch. Glad surgery is over & all is good! I honestly thought you painted the wave, Darnell--that is an amazing stamp! I'd framed that card! You were inspired--such beautiful work, my friend! Hope you're staying cool--this heat is just too much & I know it's worse where you are! Oh what a wave...fab-u-lous stamp Darnell and ultimately a fabulous card too. Love the HI card too! You have been very productive I have to say! Knicker drawer? Sort it all the time along with the socks!! ...lol. So glad your nervous time was put to such wonderful use. The cards are gorgeous. Continue to heal my friend and don't overdo it. It seems I am the last to know about your latest op in the hoohaw department, D. Why, oh WHY don't these doctors just take advantage of a sale while they're shopping? a two-for! would that be so hard to give a girl? Looks like you are going to live to clean another drawer, which I'm so very happy to hear, my friend. Sorry I wasn't around to cheer you up ... But you're back to your beautiful card-making self! Hi there Darnell, pleased to hear you are feeling better and the op went well. Wow Darnell!! I'm trying to resist looking at that wave card too long because it's trying, mightily, to pull me into its spell and make me buy one of those stamps as well. I've seen videos of the layering stamps but this is ten steps up from what I'd seen so far. The texture is GORGEOUS!!! Love the pink sky, which makes the blue of the wave even more dramatic...oh my goodness. I doubt that this stamp will ever go out of style because the sea is timeless, right? In the meantime, I'm so glad to hear that you're recovering and that all your innards are settling in for the duration. Can't think of a better way to spend your time than making cards, recuperating or not. Oh, and yes, they still make those shiny beachballs! My 6 year old granddaughter's class gave them out a party favors on the last day of school. Some things never change! Three fabulous creations, super colours and design. So glad to hear that nothing else is going to fall out and so pleased you sorted out your underwear drawer too, be prepared. Glad you got through everything ok! And I LOVE your cards, and as usual, your amazing blog and sweet spirit that comes across in your blog, always brings a smile when I read it. Cool cards! Really love the Wave. 👋🏻👋🏻 Glad to hear the latest op went well and you're on the road to recovery. Lots of hugs from FL. Wonderful cards! You MUST be feeling better, and that's great! I'm so glad! Now, close those legs & don't let anything else fall out! Love you. So glad to hear you are healing well Darnell, you have been in my thoughts! Love your cards! The ocean wave is amazing, easy to see how it hopped to the top of your must have list. That ocean wave is amazing. Great idea to stamp in different shades and then over-stamp the first layer and heat emboss in white. So creative and clever. Love the soft colours of your summer sky too. And the third one is just plain fun! :) I would like to be there. Soaking up the sun, relaxing in that comfy deck chair. Love it! Darnell, So glad to hear the operation went well.. and your getting back in the swing of things. Just don't overdo, okay?! All of your cards are so wonderful Darnell. I'm glad things are looking up. Hugs! Feel so bad that I am, as usual, very beyond with visiting! Wish I had known earlier about the time of your hospital trip. I knew you said it would be summer and gosh, here it is already! Time sure does fly as the years click by!! But I'm so glad things went well. Your cards are fabulous! That wave looks like an excellent investment and bet you'll find many uses. Take care--you'll be back making cards super soon!! Darnell, so glad to see you in apparent fine fettle ( wonder if there is a coarse fettle & WTH is a fettle anyway?). Love the cards- that first wave is spectacular. Be sure to take care & let Hammy or the Mister do the heavy lifting. Sending hugs. Lots of prettiness happening here today Darnell! I like that lovely butterfly paper peeking through the large letter openings. So happy to know you're doing well. Sending lots of love and hugs your way! Beautiful watercoloured wave and fun beach scene, Darnell. So pleased you were able to play with us on CAS Watercolour. We all have so much fun! Hugs to you and hammy my friend. I am so happy that you are home and doing well! That's the best news! Your cards are wonderful ... I have to say I went on to order that wave stamp set- I though it was terrific! But then I saw how much the postage was and that was that... I'm wishing you good health and a great recovery... Big hugs! Hi Darnell...love how you used the Hi and the negative space so effectively and oooh that wave looks super super gorgeous ...no wonder you couldnt resist! Wow! That sentiment should come with the wave set. How cool is that? Love that card with the white embossing and pretty blues. Of course, your big "hi" grabbed me right off. Just think of all the pretty papers you can use. The butterflies are perfect! And still one more card... you are one productive stamping gal! Glad you're home and recovering nicely. Take care! Nice of array of cards Irma. Glad you could be productive before the big day and not sit and do nothing. Everyone needs a neat and tidy undie drawer. I have been reorganizing my closet and have two large bags for donation. Neat and tidy is my middle name. Hope you continue to heal quickly. A big hug, Barb R.
Good to hear that you are up and about and more importantly, that your grundy drawer is ship shape. Fabulous cards as always but the wave card is off the scale in Wowness. Beautiful texture and movement. Hope your recovery is swift and pain free. Cute card!! Glad to hear your surgery went well! Praying for a speedy recovery! so glad all went well with op and you are on the road to recovery. Your cards are as usual amazing and awesome. Their designs are so wonderful and superbly created. Love that wave one it's very stunning and very unusual. Love and big crafty gentle hugs from my house to yours. 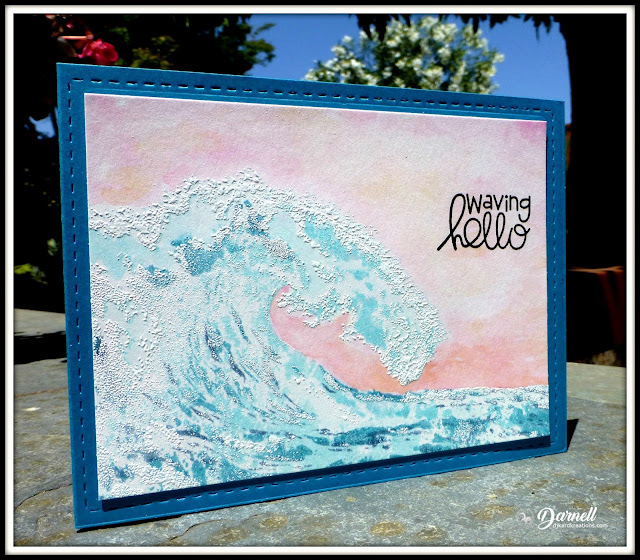 Jenny L.
Wow Darnell what amazing cards - I can sea why you fell in love with that wave stamp!! Paired with that sediment it made me nearly spit my tea - pays me not to eat when on the computer. Love how you have used white embossing to form the foam. Welcome to the hysta sista club!! Praying your recovery is swift! Great to hear that you're feeling well! Don't overdo it though! The wave card is nothing short of SPECTACULAR!!! Seriously amazing, awesome, fabulous! Swooshed me right off my feet! Lazy days of summer - totally 'sigh worthy'. Yep, instantly made me relax! LOVE, LOVE, LOVE the glossed up beachball - makes it look like it just rolled in from a quick dip in the ocean! Haven't shopped for a beach ball in quite some time....so no idea if they still make them! Likely have been declared a hazard and have been yanked off the shelves! Wow that wave is so cool! Love the effect you created for the foam. Thanks for playing with us at MMM. I am late with wishes, as always. So happy to see you working it out with some stamps and ink. Also very happy that you did not leave that wonderful sense of humor in the OR. Rest, relax and restore! I am amazed at how productive you can be while still in recovery mode. Are you wonder woman in disguise? So glad your recovery is going well. Just try to take it a little bit easy, ok? You totally CRACK ME UP!! No, I DID NOT organize my undie drawer before I went in for my hysterectomy, though I probably should have! I was lucky to just get the house cleaned before I went in!! LOVE your three cards. The large sentiment with that lovely paper is so clever. Why don't I think to use more pp on my cards like this? I have so much and it is a no brainer!! That wave is spectacular. Another stamp that I do not need that I have seen so many lovely cards made. I like the texture with the embossing and your sunset rocks. That last card with the little chair and the beach scene-marvelous!! I bet you wish you could be there right now!! You will be soon. Continue recovering with that smile!! Glad you are doing so well, Darnell. And even better now since I WAY behind in commenting. I saw a card TaeEun made with that wave stamp and it is fabulous. I love the embossing that looks like foam. Absolutely love the water cards. No kidding Laura Jane's card, eh? But I love your sky-blue-pink sky even better! And those sketchy waves on the other card - perfection!! !